Students from PSJA ISD attend criminal justice course at South Texas College's Regional Center for Public Safety Excellence building on Thursday, Sept. 20, 2018, in Pharr. Four days a week, high schoolers from the Pharr-San Juan-Alamo school district take college-level criminal justice classes in a new training facility alongside police and firefighter cadets. South Texas College inaugurated the first building of its first campus in Pharr, this fall, opening its doors to those training to become part of local law enforcement agencies and to current agents seeking additional training. This includes police officers, firefighters and border patrol agents, among others. 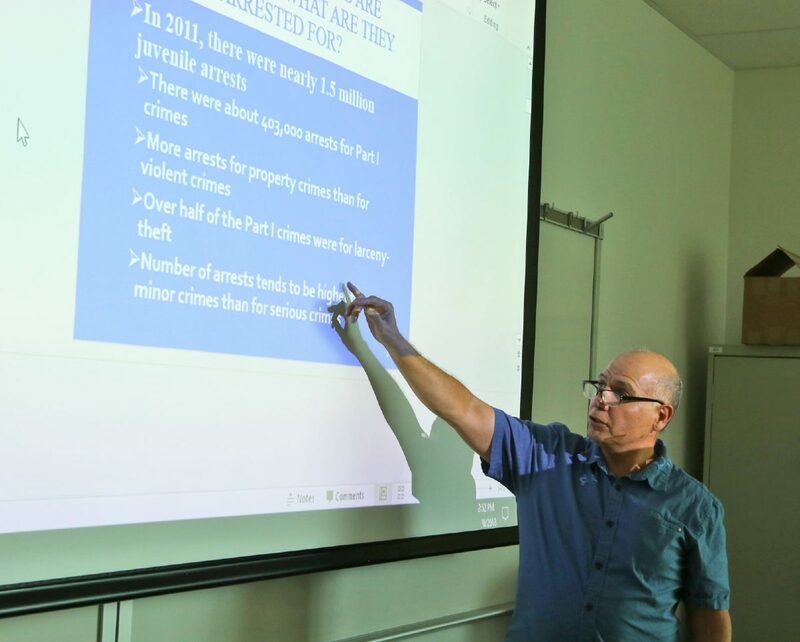 Instuctor Oscar Lopez lectures to students from PSJA ISD as they attend criminal justice course at South Texas College's Regional Center for Public Safety Excellence building on Thursday, Sept. 20, 2018, in Pharr. This first building for the RCPSE was created through a partnership between STC, the city of Pharr, the Department of Public Safety and PSJA school district. All initial contributions resulted on the nearly $10 million, 19,500-square-foot facility, which includes shooting and driving simulation labs for both U.S. Customs and Border Protection and law enforcement students, and the only vehicle driving track for law enforcement and emergency vehicle training south of San Antonio. But this first building is a small part of a masterplan to create a $71.28 million center, slated to offer training grounds for all of these local, state and federal law-enforcement agencies overtime. The school district contributed 10 acres of land valued at about $370,000 and $1 million in funding, and asked to have at least four classrooms available for dual enrollment courses. “These are all great things that our students are being exposed to so that they can know once they earn their criminal justice associates these are all the other careers that are open to them,” said Griselda Quintanilla, career and technical education director at PSJA school district. 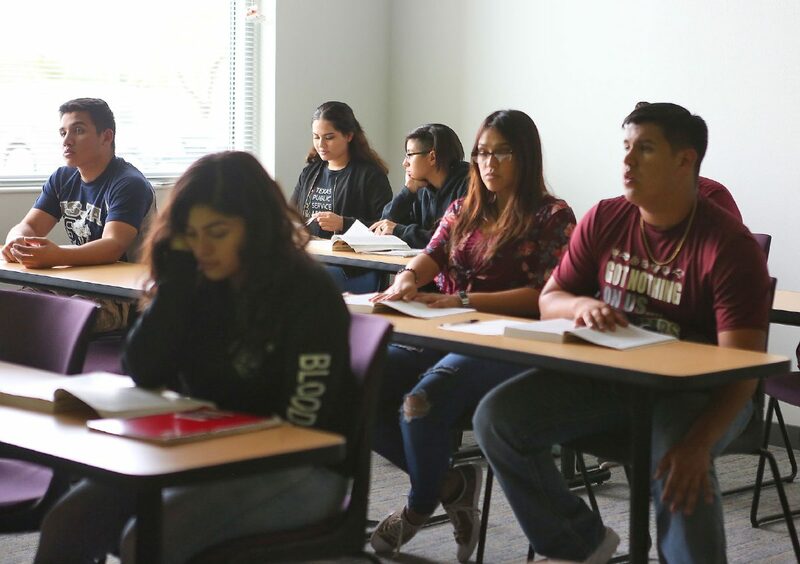 Even though these courses are part of an associate-degree plan, Quintanilla said these students can also acquire certificates that could allow them to seek a job in any of these areas while the attend college or even sometimes make up their mind about their future plans. The same goes for those who thought of law-enforcement as their only career-path after high school, King said, as going to classes in this facility and seeing the other degree plans might encourage them to also attain a college degree. There are currently 50 to 60 high schoolers in these classrooms taking classes from Monday through Thursday, but as time progresses district officials hope to increase the size of the cohort and the number of classes being offered. The hope is to expand the career options especially in high-demand fields in the Rio Grande Valley, and get them fully trained to move on to college or to the workforce. Right now, these younger students might not be able to take full advantage of some of the perks of the building, such as the simulation labs, due to age or training constraints. But Quintanilla said they hope to overtime develop programs and courses that could get these students ready to take full advantage of some of these areas.